Now you are getting to the exciting bit, your first homebrew cider, where the sugar begins to turn to alcohol! But wait! There are a few steps to follow before this happens. To proceed to the fermentation stage you will need a few more pieces of homebrew equipment; a number of 1 gallon glass demijohns, a syphon, an airlock, sterlising solution. Firstly it is important that you thoroughly sterilise this equipment. Rinse the equipment in cold water. Clean it with a sterilising soloution made by disolving a campden tablet in water. Once this has been done you must rinse the equiment throughly making sure that all the chemicals have been removed. Sulphite is the process of sterlising your apple juice by adding sulpher dioxide (So2 – i.e. campden tablets) to rid it of any unwanted bacteria that could potentially spoil your cider. However, it can kill off some of the wild yeast so you may need to add a little extra yeast. This is not an obligatory process, so for all you pure naturalists out there you have no need to worry. But note that the apple juice could contain bacteria that may potential spoil the flavour of the cider. 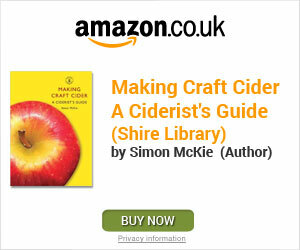 It is difficult to brew cider through its natural process. Be careful when sulphiting the juice not to add too much of the chemical, use So2 sparingly. Knowing how much to add will depend on the Ph level. You will need narrow-range indicator papers (see equipment) to measure pH levels. But as a rough guide 1 campden tablet dissolved in 1 gallon of water provides the equivalent of 50 parts per million (ppm). The general advice is to use 1crushed tablet per gallon of juice if the pH level is 3-3.3. Leave it to stand for about 48hours. If your pH is lower than 3 then no campden tablet is required. If it is higher than 3.3 you can use 2 tablets. You could always divide your juice up and try fermenting some of it naturally, without any sterilisation. Pour the pressed juice into the sterile demijohn. If you have sulphite the apple juice leave it to stand for approximately 24 hours then add a sachet of cultured cider yeast or dried wine yeast and give it a stir. It is the yeast that aids the sugars to turn to alcohol. You could try leaving it without adding the yeast and hope that not all of the natural wild yeast has been destroyed. However, the juice may take longer before it begins to ferment. If it is taking to long then you could try adding some yeast. If you have not sulphite the juice then you can leave it to ferment naturally. It will longer for it to ferment so you may need to be patient or you could add a little yeast to get it started. Once you have filled the demijohns and added the yeast place a fermentation airlock in the top of your jar. This will prevent the air contaminating the juice and at the same time allowing the release of carbon dioxide. To help kick start the fermentation place the jars in a warm place (not too hot). As the fermentation begins you will see it begin to bubble rappidly in the airlock. Fermentation should begin within a couple of days. Once the fermentation has began put the demijohns in a cool place. When the bubbling has slowed to a snails pace, looking as if it has nearly stopped. This may take up to a couple of months. Syphon it off the lees (sediment at the bottom of the jar) into clean demijohns and leave it to finish fermenting and clear. Once it has cleared syphon the cider into bottles and drink at your leisure.